The ML8000 Advanced Limiter is the next generation of limiter technology, using two completely separate stages of processing for significantly improved peak level adjustment. 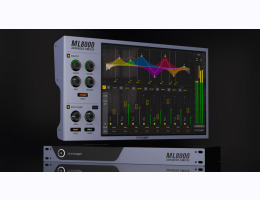 The first stage of the ML8000, the Multi-band Limiter, uses 8 bands of active processing for superior phase response over traditional cross-over based processing. Each band has its own gain and threshold (output ceiling) control. Additional overall band controls include release time and limiter modes, calibrated similarly to the modes of the original highly acclaimed McDSP ML4000 limiter. An additional focus mode provides subtle articulation changes in how each band tracks and limits the incoming signal. The second stage of the ML8000, the Master Limiter, is a precise recreation of the patented ML4000 limiter algorithm, right down to the limiter modes. The Master Limiter also includes filter design enhancements to further reduce peak distortion. The ML8000 8-bands of processing are easily controlled from the response plot, large gain faders beneath, and convenient threshold markers aligned to each band’s input meter. Text readouts can be adjusted from the keyboard, or controlled with mouse movement. Any number of bands can be linked to another band, and each band can be solo’ed or have its key input monitored. Visual feedback, multiple metering sources, and an intuitive user interface make the ML8000 an easy choice for the audio professional. AAX DSP (32/64-bit), AAX Native (32/64-bit), Audiosuite, AU (64-bit), VST (64-bit) plug-in formats supported.